Hey girls! 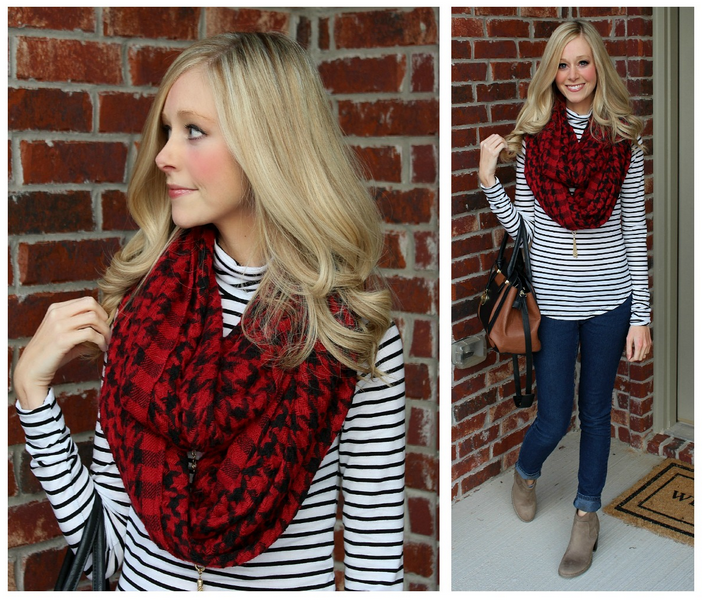 I'm co-hosting and linking up with Little Miss Fashion Queen to talk about prints! Does the thought of mixing stripes and plaid send your anxiety level through the proverbial roof? Does a mere glance at houndstooth leave you shaking in your Nine West boots? Then ladies, I’m here to set your mind at ease and give you the rundown on print mixology. Stripes and houndstooth? Don't mind if I do! 1. Combine prints with coordinating or complimentary colors. This doesn’t mean the colors have to be an exact match – in fact, that can leave you looking like a broken kaleidoscope. What I mean is pairing a blue plaid shirt with a gold houndstooth print, as blue and yellow (or gold) are compliments on the color wheel. See how that works? 2. Don’t incorporate more than two prints in one outfit. You could possibly induce migraine headaches and seizures in innocent bystanders. Instead, stick to the Rule of Two. For example, if you’re wearing a leopard print scarf and a taupe striped cardigan, don’t get crazy and throw in a polka dot clutch for good measure. Let the leopard and the stripes do their thing. They are the Beyonce of the ensemble. The rest of the outfit should sing back-up. 3. Start small if you’re sc-sc-sc-scared. Try sporting a fun polka dot manicure with a winter floral scarf. If that melts your butter, then you can go bigger and bolder next time. So that’s your homework this month. Go into your closet, (or, if you’re like me, just go shopping), pull out any and all prints, then get to mixing. Pretty soon, you’ll be the Carrie Bradshaw of the P.T.A. and all the other single-print-wearing moms will be, like, so jealous. Link up with Little Miss Fashion Queen to share your prints! SO I know this is about prints but girl, your hair is looking fabulous!!!! i think you can mix three if you really stick to similar colors. but that's my limit. four or more just makes it turn into a costume. floral and stripes are my go to. Your hair is the BOMB girl!!! Go head' and rock those stripes and houndstooth. Thanks so much for Co-hosting, it was the best having you. It was a dream working with you, God bless!